DK Eyewitness Travel, 9780241365519, 288pp. 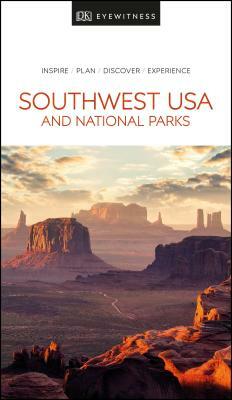 Discover Southwest USA with this essential travel guide, designed to help you create your own unique trip and to transport you to the region before you've even packed your case - drive through the stunning landscapes, taking in the Grand Canyon, the Rocky Mountains and the red sandstone mesas of Monument Valley; taste the high life in Las Vegas; visit Spanish Colonial Mission churches; and explore the ancient ruins of Ancestral Puebloan civilizations. The DK Eyewitness Guide to Southwest USA and National Parks covers the must-see sights and the hidden gems, so you won't miss a thing. * Reasons to love Southwest USA and National Parks: natural wonders, breathtaking landscapes, abandoned Native American cliff dwellings, old mining towns, the glamour of Las Vegas - what will yours be? * Expert tips to make memories that last - where to snap and share the perfect photo, take in stunning views and which are the best scenic roads. DK Eyewitness Travel Guide Southwest USA and National Park is a detailed, easy-to-use guide designed to help you create your own unique trip. On a shorter trip? Try our DK Eyewitness Top 10 Las Vegas.